Posted on October 17, 2017 at 4:53 pm. Canberra Casino is the only land-based casino in Australia which doesn’t have poker machines, and while recent reforms are set to change this, certain details have stunted its progression. In August, the Australian Capital Territory (ACT) Government introduced legislation allowing the Canberra Casino to install 200 poker machines. There are several conditions included in the legislation, including a lower maximum bet per spin than ACT clubs. While the ACT Greens made it clear they would only support the legislation if the poker machines are capped at $1 per spin, $5 per spin is also being suggested. But the Gaming Technologies Association chief executive, Ross Ferrar, has revealed that even the $5 per spin limit on Canberra pokies is not feasible, especially since pokies in ACT clubs are limited to $10 per spin. 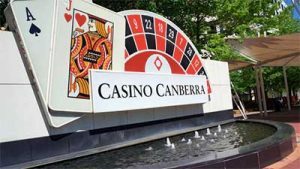 “It is very difficult for us to understand how it would be possible to provide the Canberra casino with unique games with unique machines at a cost that would be anywhere near capable of sustaining a business case for their purchase,” Mr Ferrar told the Canberra Times. While pokies in New South Wales, South Australia and Queensland are all capped at $5 per spin, Mr Farrar said that these games had already been developed and tested, and then retested again, as per state legislation. Although the poker machine industry could do it for all pokies in the ACT, developing and retesting machines for a single venue, which can only have 200 machines, is reportedly not “viable”. As a result, the industry group responsible for online poker machine manufacturers wants the maximum bet limit increased to $10, which is on par with the territories’ 5000 machines. It has stated that if the bet limit is under the $10 threshold, then it must be a unified limit in all poker machine venues. However, ACT clubs are unlikely to comply, and since the ACT Labor government makes $24 million a year from these machines, it is unlikely to support a maximum bet reduction. The legislation also includes a mandatory pre-commitment scheme, which would require players at the casino to disclose the amount they plan on losing on poker machines. Mr Ferrar said the scheme was “contrary to the concept of hospitality”, as problem gamblers could disclose incredibly high limits which are unachievable and only exacerbate problem gambling. While the bill is yet to be agreed on by the government, the approval of 200 poker machines was initially required in order for the $AU300 million Canberra Casino renovation to commence. The government has since made a concession which allows the casino to commence a section of the redevelopment before installing poker machines. Looking for higher maximum poker machine limits? Online pokies mirror limits found overseas, including the UK where maximum limits can get up to £100. You can find a range of high stakes online poker machines, fruit machines, slots, or whatever you prefer to call them online too. You can also set yourself limits to ensure you’re gambling well within your means at secure online casinos. We recommend players from United States check out Raging Bull Casino for the best range of pokies.